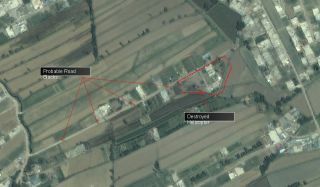 This image shows Osama bin Laden's refuge home with no apparent structural damage, the remains of an unidentified helicopter within the compound perimeter and four evenly spaced road blocks on the road leading to the property. New satellite photos of Osama bin Laden's compound in Pakistan, where he was killed May 1 in a military raid, offer a revealing glimpse of the operation's aftermath, including roadblocks leading to the complex and the disabled helicopter thought to be part of a top secret U.S. defense project. The images, released by the commercial satellite and aerial imagery provider GeoEye, zero in on the bin Laden compound in Abbottabad, Pakistan. The photos show no apparent structural damage to the buildings, but the remains of one U.S. Navy SEAL transport helicopter can be seen. These covert ventures typically use new, innovative technologies, and the downed helicopter from the bin Laden raid could be a modified Blackhawk helicopter that is designed to fly quietly and evade radar detection, David Cenciotti, a military aviation journalist and information securities expert based in Rome, told SPACE.com's sister site TechNewsDaily. This overview shows Osama bin Laden's compound proximity to the Pakistan Military Academy and the densely populated area in which it is located, and not isolated as speculated. Cenciotti noted differences in the aircraft's horizontal stabilizer and tail rotor. He also observed that the helicopter's blades were flatter, and not wing-shaped like in other helicopters, and they were partly obscured by a metal plate resembling a hubcap that he speculates could be anything from a stealth cover to an armor plate or some type of noise reduction device. The Herndon, Va.-based GeoEye uses its high resolution GeoEye-1 satellite to image tens of millions of square kilometers of the Earth each year.